Who developed Vojta Diagnostics and Therapy? The principles of reflex locomotion, as well as Vojta Diagnostics and Therapy, go back to Prof Dr Václav Vojta. 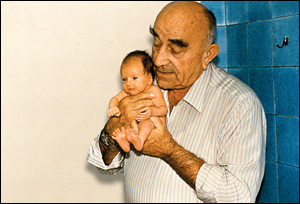 Prof Vojta, who was born on the 12th July 1917 in Mokrosuky, Bohemia, the Czech Republic, and who died on the 12th September 2000 in Munich, was a neurologist and paediatric neurologist; he emigrated in August 1968 from Prague to Germany, and worked at the University Orthopaedic Clinic Cologne, as well as at the Munich Children’s Centre, and taught from 1990 until his death at the Charles University in Prague once more. Prof Vojta developed the bases of his diagnostics and therapy, the Vojta Principle, between 1950 and 1970. The Vojta Principle starts out from what is known as reflex locomotion. While looking for a treatment for children with cerebral palsy, Prof Vojta observed that these children responded to certain stimuli in certain body positions with recurring motor reactions in the trunk and the extremities. The effects of this activation were astonishing: Afterwards, the children with cerebral palsy could first speak more clearly, and after a short time they could stand up and walk more assuredly. Because the patterns of movement that could be activated in these children with spastic cerebral palsy were not present in their spontaneous motor activity, but could now be activated incompletely, and ever more comprehensively and completely with multiple, repeated stimulation, Prof Vojta concluded that movement development in the infantile spastic might be subject to functional blockades. 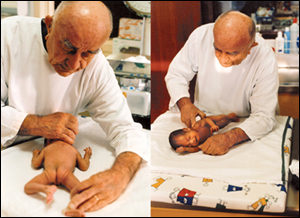 His far-reaching idea that these activatable patterns of movement had to be inherent and present from birth in everyone was confirmed when he was regularly able to induce and demonstrate these patterns in healthy new-borns, and among them were movements, such as radial abduction and opening of the hand, that in the normal development of a child first appear at the age of approx. 6 months in spontaneous grasp and support with the hands. Prof Vojta’s observations and assessments of the patterns of movement in spontaneous movement, as well in postural responses in new-born babies and his assessment of the dynamic of primary reflex development represent a unique form of early diagnosis of postural and movement disturbances in infancy. Vojta’s early diagnosis is used nowadays in order to recognise early motor malformations and to be able to provide a child with suitable therapy as early as possible (within the first 6 months of life), since timely treatment counteracts the appearance of “incorrect movement sequences” and offers the best chances of recovery.